Some more soups were left to blog but I have no photos for them so decided to post them later. Meanwhile my family craved something spicy and meaty and so here it is...Chicken malai tikka.I am sure my readers in the metros in India have their favorite tikka/kebab corner, which they frequent regularly and hence wonder why we bother making this at home. If I could access Nizamuddin, Karims, Delhi Durbar or Bade Miyan here, I would choose to just sit back and eat. But the food in the Desi restaurants here look reasonably desi, smell good but the food is a watered down version of the real thing. All color and no flavor. So when we meet up, my friends and I take turns making the grilled tikkas as appetizers and each of us have a wonderfully unique recipe. And on a week night, this is good for dinner....A green salad, some tortillas or pita and a tzatziki sauce or yogurt sauce, all wrapped up makes for a sumptuous meal. This is one of the typical marinade for chicken kebabs or tikkas or whatever you want to call them. 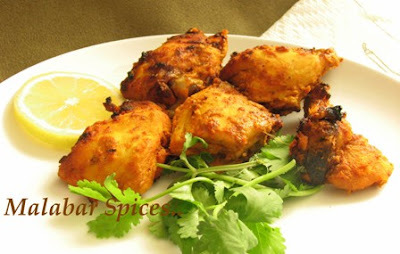 The names have been used interchangeably by everyone for small bites of chicken marinated in a yogurt based spice mix and grilled.The literal meaning of tikka is "pieces of chicken" and the word Kebab or Kabob is generally used for minced meat or cubes of meat on a skewer, usually marinated before cooking. The malai in the name comes from the addition of yogurt, sour cream or cream(malai) in the marinade and even butter to baste it. It adds a creaminess to the chicken's texture and makes it soft. Traditionally made in the clay oven, tandoor, the tikka is cooked surrounded by the high heat for a short time. It imbibes the smoky flavor and cooks fast, leaving it crusty outside and juicy inside. Since my version uses just a whole chicken cut up into small pieces, some with bone in it, I call it tikka. Kind of a smaller version of tandoori chicken. You could make it with boneless cubes too for ease of eating but the flavor is entirely different.. So its your choice, really. The boneless version is good for making chicken tikka masala, a very popular creamy chicken curry. I have tried many recipes for the malai tikka, some with cream and some with sour cream or yogurt but this combination is what I end up using week after week. The others are really good too and when you do have sour cream or leftover cream at home, its great to use them but who wants to inject fat unnecessarily? So I stick to yogurt which is thickened and that gives it a rich flavor without too much fat. To make thick yogurt, hang the required amount of yogurt in a clean tea towel and place in a large strainer over a bowl. Leave it for as long as you need. After about a hour or more, the whey would have drained out leaving behind thick yogurt. You could also buy Greek yogurt instead and use that. A whole chicken cut up into small pieces. Use a 2 to 3 pound size one. Cilantro - 1/2 cup finely minced. Blend all the marinade ingredients in a blender . Marinate the chicken for at least 2 hours or over night in the refrigerator. Skewer the chicken on either wooden or metal skewers. I usually make it without skewering out of laziness and it tastes just as good. To keep bamboo or wooden skewers from burning, soak for several hours in water before using. Outdoor: Clean the grill grating and oil with a cloth. Preheat to the maximum heat and grill for 15 minutes, trying not to keep turning them over all the time. Just turn once midway and baste with oil. Indoor: Preheat the broiler or set the oven to the highest setting say 500 F. Place a grill grating on top of an aluminum foil lined tray. Brush with oil and spread the chicken on the grate. Grill for 7-10 minutes on one side and then turn them over.Total maybe 15 to 20 minutes. Baste with butter or oil in between if it looks too dry. The timings may vary based on your oven's heating and type so use your judgment. If the quantity of chicken is less, it will take less time. When they are done, the pieces would not stick to the grate and only a clear juice will run out. Garnish with onions, cilantro and lemon wedges..enjoy! Serve hot with Mint Chutney. Drool,drool.....! I've to go back and read the recipe again...it's making me hungry already! Looks totatlly yummy Shaheen. Wondering why the name Malai? You are going to make me gain more weight! :D Lol! hey your soup came out beautifully thanks!! Ummm one more thing... I was wondering if you can help me out here. I'm in the US too and I want to grow Curry leaves. I stay miles and miles away from the nearest Indian store and it gets frustrating when i drive all the way only to see that theu've run out of it. Any idea where and how I can? Oh I love these kinds of dishes. Shaheen this looks perfect and I'd love to sink my teeth into them! I made your ulli chicken(did I spell it right) last weekend. Shaheen, I have not seen R lick his plate and fingers like that and the number of serving he had..It was a pleasure to watch, thank to you. Yummmm... How do you ever find the time to blog with all your responsibilities Shaheen?! I tried your Sweet Corn Chicken soup. It turned out great! I love tikkas too..the second pic is way too tempting! that looks so yummy.. good to see you get back to blogging slowly and steadily :) hope the baby is doing good now! It's only 10.30, I've just had breakfast and you're making me hungry again. How are you doing, Mallugirl? Oh Really good. I want to have them. oh ,it looks so heavenly!...looks wonderful! These get finished in a jiffy in my house. I sometimes prepare butter chicken with these malai tikkas, it turns out soooooo delicious. And learnt about this from Williams Sonama-Savoring Cookbook. I suggest you try it out too. Your family will definitely love it. girl.. iyyo,,,i'am sitting and drooling !!!! and how come u r having an add in bahasa maleyu in ur blog??? Bearing the ulli chicken in mind I made a baby potato dish and blogged recently...came out very well..and eventually became a hit post :)..
thanks kalai, just a lucky shot. indo, malai is from the addition of cream..i used yogurt though. mac,glad u liked the soup. where do u live? i do have a curry leaf plant at home but its still a sapling.my friend has a big one though.i wonder if a sapling can be fed exed. meeta, come on over and u can bite into them. hankari..it makes me happy to have u write in. how are ur classes filling up? asha, hmm..blogging is an addiction..so maybe there is a pile of laundry undone for every post! :)glad u liked the soup.can u give me some of ur chicken recipes? I tried this out last weekend and it came out very well. I used the exact spice measurements you had said except for the chilli poweder, which I decreased. Thank you! i am an avisd followr of your posts. could u tell me if king fish, karimeen etc are avialble in USA. if so where? I am totally with you on the cream. I make chicken tikka with greek yogurt. Although I just made a Murgh Hara Tikka with sour cream and it came out fantastic. Wow! wonderful post! what a nice picture. Way too tempting. Yum! I don't have an outdoor grill, but well now I know I can try in my oven too, so I'm gonna try it out very very soon. Thanks Shaheen. As it is i need to drive around 30 miles to get to the nearest store and yesterday I discovered that they're banne from selling curry leaves any more. ARRRRRRRRGH! Hey, what's your email id? Hi. My family and I just arrived back from 10 days in London, where we discovered the joy of Indian foods. I am trying to make some, as there are no decent Indian restaurants in our area...we've been told. That is how I ran across your blog. But I am having trouble accessing other recipes; when I click on the right hand side in your food category lists (for example, on the chutney scroll down list and click on garam masala) nothing happens. Can you help? 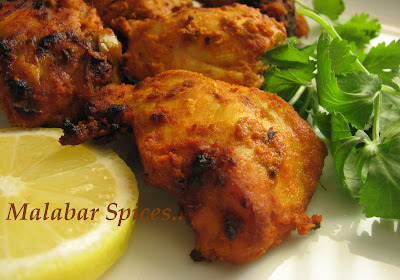 I plan to make this Malai Tikka next week, and would like to make more dishes from your site. Thanks. Turmeric typically is not added in the malai tikkas.That is why they look white in color after grilling. Also, some cheese is added. This is per hotel recipes. That chicken malai tikka looks great.. I also make something similar often..and it is a hit..
New visitor to your blog..arrived here via foodblog hopping and tried this recipe out..came out fantastic! just like at the my fav eateries in India...my husband and I cudn't believe its possible to even make it at home.. I always thought the restaurants had some secret ingredient! 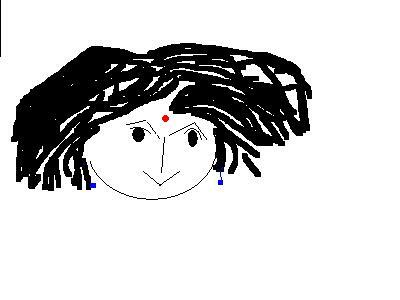 Thanks a ton..love your blog. Thank you for another lip-smacking recipe! I was attracted enough to make it today for iftaar but something went wrong in the cooking process.Maybe you could help me and advice. I recently bought an oven which doesn't have any temp. reading just the usual high and low marking and only any one of the burners (either the top or the bottom) can be lit at a time. Most ovens here come as described above and I am new to them. So as per your recipe, I preheated the oven using the lower burner at the high temp. marking and after 10 min placed the meat for grilling as you'd described in the lowest rack just above the burner. I noticed it wasn't cooking as it needed to and so lit the upper burner and placed the grill tray on the top rack. Still not much cooking. So I lit the bottom one again lowering the grill tray. I ended up shifting between the 2 burners and moving the tray between them back and forth and the entire process took me an hour and a half just to grill a pound of chicken! It sure was my first attempt at grilling meat but I am sure I wasn't doing something the right way. I'm sure you must be busy with Ramadan, nevertheless I'd appreciate your suggestions on what could've gone wrong and any advice on how to best use my oven for such purposes.